That is “Valyria fell before, but the sun continues to rise”. That’s the literal translation. Discounting final consonants, that does work. Nice job! In the comments, Mad Latinist suggested that it shold be ropetas? It should not: ropatas is correct. This is because the stem is ropa-, not rop-. Easy mistake to make, though. My previous Miresua conlang word for today was gänan. I decided to make this a 6-letter word. There are more than enough 5-letter words. The word today (actually as to-day) occurs four times in Alice's Adventures in Wonderland. The Cheshire cat asked Alice, "Do you play croquet with the Queen to-day?" Imagine a language where the closest to a verb such as 'to stand' really only signifies 'to do something in an upright position'. In English (and all other languages I know), when walking, you do not stand - you're doing so in an upright position, but you're not standing. Thus, to express 'I am standing (still)', you'd say something like 'I am and do so in an upright position', or 'I do nothing, and in an upright position'. Now, the verb 'to stand' is flexible enough for lots of periphrastic things, but it'd seem this kind of 'gap' in its meaning would lead to even more periphrasis. I'm in the process of revising for publication Beneath the Mountain of Heavy Fear, v.4 of The Labors of Ki'shto'ba Huge-Head. In this book Ki'shto'ba and its Companions venture into the lands of the At'ein'zei, the People of the Root, a variant species of the Southern Nasutes. They sojourn briefly in a fortress called No'ka'rim'bu'u, where Di'fa'kro'mi the Remembrancer learns the following tale, extracted from Chapter 2 of the book. If you're interested in comparing it with the Creation Myth of Di'fa'kro'mi's people, the latter can be found in the sixth chapter of the second half of The Termite Queen, v.1: The Speaking of the Dead. I never lost my curiosity about Creation Myths, however, and the Remembrancer of No’ka’rim’bu’u was willing to relate her own. The Nameless Mother, she said, lives in the Primal Cave among the roots of a giant tree that the At’ein’zei consider to be the centerpost of the world. She nourishes it with the secretions of her integument, for if it should die, she would die as well and then the world would end. This is why these people were called the Offspring of the Root. The shell of the Primal Cave keeps the world stable; groundquakes happen when rocks slip out of place in the Holy Walls. Whatever the nature of the center of the world, the Highest-Mother-Who-Is-Nameless laid her first eggs without benefit of a King’s insemination, and she was so fecund that soon the chamber became crammed full. This forced some of the eggs to burst out of volcanic vents onto the surface of the world, from which they shot up into the sky and hatched into stars. These were the first manifestations of light above ground. Still other eggs burst their shells within the ground and heaved up the mountains. Others emerged as rivers and fungi. However, after a while the Nameless Mother grew lonely and caused some of her eggs to hatch into Kings, not for the purpose of insemination but to serve as companions for herself. Then she hatched others into Alates so she and her Kings could have cooler light than that which came from the hot stones of volcanoes. Thus, they call Alates “Fire-Wings” rather than “Star-Wings,” and light-making, which we regard as fit only for Alates of the dimmest wit, is a highly respected occupation among the Southern Nasutes. Even then, the Nameless Creator was not fully satisfied, so she resolved to populate the world with creatures like herself. She produced a copy of herself and made a Holy Chamber for this First Mother near the surface of the ground, where she could lay eggs of her own. At first the only Castes were Alates and Workers and King-Companions; they all had eyes and could do anything they liked except dig their way to the surface. But the Mother and Kings and Workers soon broke that taboo – only the Alates remained faithful to the Nameless One’s command – and when they saw the world with its rivers and mountains and stars, they fell in love with it. So the Nameless One was angered and she resolved to punish her creation. She took away the Workers’ eyes so they could not see the world they loved. Then she ordained that they should no longer be nourished on the Great Root but should live in the World Above forever, dependent on whatever they could glean therein. Furthermore, they would have to contend with one another for living room and sustenance. For that purpose she created Warriors, eyeless and dependent on Workers for their food so they could not grow too powerful. The Alates, who had never disobeyed her, were allowed to keep their eyes and she rewarded them by making them a conduit of holiness from herself to her creation. Soon she realized her offspring were languishing in this dark world, where the only thing to eat was fungus and the only warmth came from the volcanoes and the only light, from the stars. So she made the sun out of the excess of the world’s hot volcanic excrement so they would have warmth and light, and she caused the Primal Root to send up shoots and generate the first trees and all the other plants so there would be a greater variety of nourishing food. Then, having become infatuated with the act of creating, she made the animals also, simply because she could. She discovered that this new order of things amused her greatly. She would sometimes thrust her head out of the ground so that during darktimes her eyes were visible in the sky watching her world. She had disciplined the Mothers by immobilizing them underground and making them dependent on the King-Companions for procreation, but when this latter arrangement proved more of a comfort than a punishment, she decided to give her own Kings the same function. Ever since then she has mated, but it is said that even to this day the Highest-Mother-Who-Is-Nameless does not really need her Kings and sometimes grows tired of mating and casts them aside, or even eats them. When this happens, great storms and droughts and catastrophes come upon the world. All of this was quite novel and fascinating to me, since it was both unlike the Shum’za Creation Myth and reflective of it. Indeed, our own tale was beginning to seem a bit oversimplified to me. I have related only the barest chitin of the myth here. It closely resembled the Yo’sho’zei version, although that latter was even more complex. There was a challenge posted on Facebook to translate this song, and I'd been trying actively to NOT for a while. It was stuck in my head pretty strongly, but I was so determined, haha. I've got to stop creating new content for a while in order to focus on what already exists, so that I can get it ready for the Antho in April. Sandic is ten years old this year!! This song HAS been sung, but it comes out so very badly that I can't even. :p Sorry guys. zum mee-e yahl ba ere. iab ba feel baneot keesa! ialth yahl ba le:yus wii le:yar! jilab pal me peeteneot raug. beeno me bapatas dru le:yus, pa ba grawwib! apparently I am its ruler. the cold does not bother me! you will not see me sad. it’s going to be forgotten! the cold never bothers me. My previous Miresua conlang word for yesterday was azei. I changed this word because I didn't want the diphthong to be on the end of the word. The word yesterday occurs three times in Alice's Adventures in Wonderland. Soon after Alice first enlarged, she said, "Dear, dear! How queer everything is to-day! And yesterday things went on just as usual...."
My previous Miresua word for hand was uskä. This is a very minor change. I'm trying to lessen the number of nouns ending in a or ä. It'll make the grammar somewhat simplier. The word hand occurs many times in Alice's Adventures in Wonderland. When the Hatter was called as the first witness in court, "he came in with a teacup in one hand and a piece of bread-and-butter in the other." 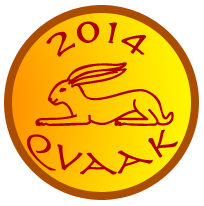 You are currently browsing the Conlangers blog archives for January, 2014.